ONE OF OUR THEMES FOR FAIR FOOD WEEK this year will be — Supporting your local community fair food projects and groups — organise a fundraiser for a group that missed out on the Community Food Fund grants or other food project or group you’d like to support. In February, the Federal Government axed the $1.5 mn Community Food Fund that was part of the National Food Plan. 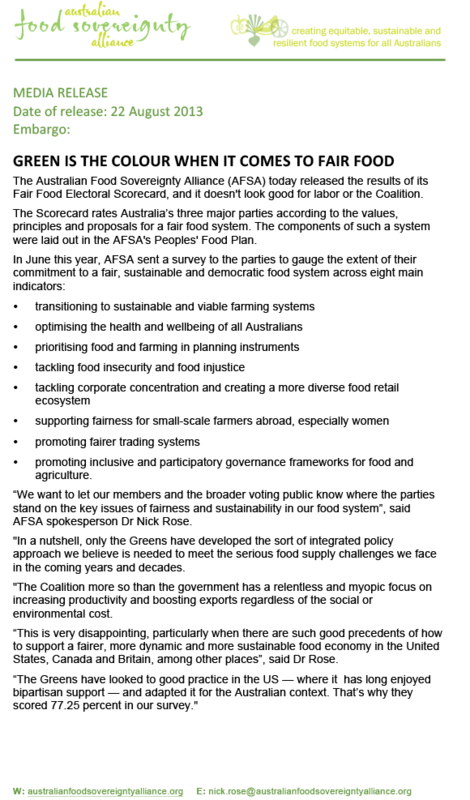 364 groups around Australia applied for grants under this fund. If you are from one of those groups, or you know of someone who applied, please let us know. We want to profile and support you as part of Fair Food Week 2014. Where government fails, communities can succeed. farmers’ markets and the rest. Fair Food Week 2014 is the opportunity to raise funds for community food initiatives denied promised funding when the federal government cancelled the Community Food Grants scheme. 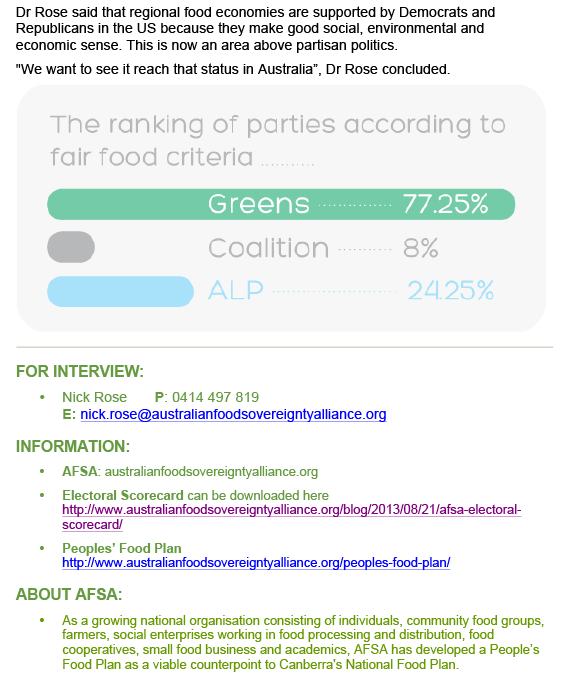 The Australian Food Sovereignty Alliance (AFSA) today released the results of its Fair Food Electoral Scorecard which rates Australia’s three major parties according to the values, principles and proposals for a fair food system set out in the Peoples' Food Plan. promoting inclusive and participatory governance frameworks for food and agriculture. Our findings are summarised below. Note that the Coalition has not yet released a detailed food and agriculture policy — should it do so prior to the election, we will update these results. The West Australian and Age newspapers, via AAP, cover AFSA's statement issued on 24 May 2013 on the release of the National Food Plan White Paper. AFSA spokesman Dr Nick Rose said there wasn't much in the plan for small-to-medium scale food businesses, which employ most Australians in the food sector. AFSA said ensuring the health and wellbeing of consumers and Australia's environmental resources should have been top of the agenda for any economically viable and nutritious food system. The National Food Plan: Does it support health, sustainability and fairness? On Saturday 25th May the Australian Federal Government will finally launch its long-awaited National Food Plan. The Australian Food Sovereignty Alliance, along with organisations and businesses representing hundreds of thousands of Australians, are deeply concerned that this Plan is taking the country in the opposition direction to that demanded by the principles of fairness, health and well-being, genuine sustainability and true resilience in what will be challenging years and decades ahead. [quote author="Dr Nick Rose" image="https://afsa.org.au/wp-content/uploads/2012/11/Nick-Rose_logo.jpg" w="" h="" image_align=""]"We are looking for a National Food Plan that is fair to Australia's food consumers as well as to family and small-to-medium scale farmers and food processing businesses and their workers", said Australian Food Sovereignty Alliance (AFSA) spokesman, Dr Nick Rose. The AFSA will offer further comment in the coming days, when we have had a chance to examine some of the detail of the National Food Plan. 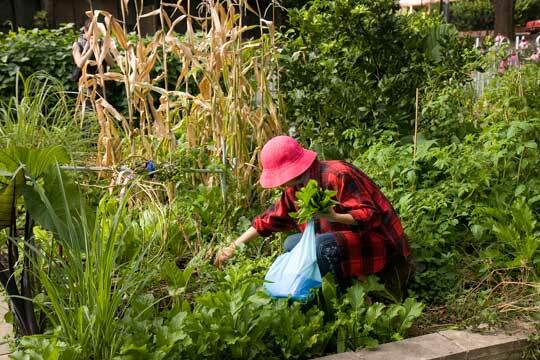 In the April-May 2013 issue of Arena Magazine, AFSA National Co-ordinator Nick Rose discusses the importance of food sovereignty and the People's Food Plan process for Australia. 85 per cent want ‘support for local and regional food systems’ to be in the top two priorities of a National Food Plan.